This is a project inspired by the thousands of photo booths seen at arcades and malls across the country. It is an installation that explores the fun of self-portraiture and the nostalgic value photostrips have as an artifact of time + place. This project however forces its users to invent an experience. Users must walk up to the camera, then smile large enough before a picture can be taken. A photo “receipt” is printed for people to rip and take home. The artistic value of this installation lies in the fact that people are challenged to produce absurdly large smiles before an artifact is created. The machine learns by observing the facial expression of its user and then acts, stores, and prints something in return. This project has many possibilities for expansion and further exploration so please comment! Motion capture is used a lot to teach machines how to move. I think it would be cool if this could be used in an interactive art project. Motion capture a person dealing with physical objects in space…a box, a swing, a larger box, a wall, steps, hole, etc. Capture many interactions with all of these objects with tons of different scenarios. Then feed this information to a computer so that when it is faced with the same obstacles, it can figure out how to interact with them based on the captured motion. This could become interactive by giving people the opportunity to place these objects down and see what they can make the machine do. This project is about the objects people are willing to give up. A central podium is the only object in the room. 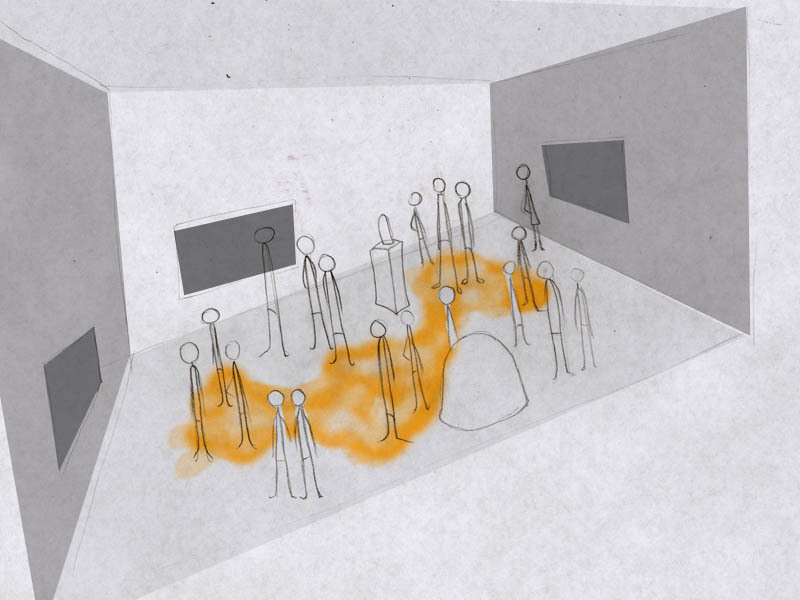 Visitors place an object on it, the podium, which should really be seen as part of the room, which is some sort of creature, decides to accept or reject the object. If it accepts the object it opens, allowing the object to drop down into it, the object becoming part of the room. The rooms projection will then change, possibly thanking the guest in some way, and displaying the object as part of the collection it has created possibly in some sort of organized way if it can identify the object, if it cannot it may take some property of the object that it understands, a color, a noise it might make, the material it is made of, and embed that in to the atmosphere of the room. Rejected objects will make the room angry, it may insult the visitor, it may darken the room, play terrible music, do something … mean. As more people come the room itself develops more personality by the ongoing collection of objects it has amassed, it likes both depth & breadth, it will be happy to receive new varieties on a common theme, or things it has no experience with. Possibly if it knows nothing about an object, it would broadcast that object to the internet in such a way that viewers at home could tag the object or categorize it, in a way it understands. Apologies to Jonathan Lethem, whose As She Climbed Across The Table had an obviously direct influence on this concept. This installation would explore the sense of self based on the workings of the biological immune system. A usual way of thinking of the edge of the self is the skin – what lies beneath the skin is the self. But we know that there are many nonself particles and a whole passageway of outside world beneath the skin. The immune system (which encompasses the skin) offers an interesting viewpoint. The immune system is a constellation of particles, cells and tissues that work together to constantly assess what is in the body, and whether what it finds belongs to the body – is self- or not – nonself. Cells of the immune system are taught this classification during their maturation. This makes the immune system a kind of barrier that defines the wholeness or integrity of the body/self in a more subtle and dynamic way. This installation would explore these thoughts by taking in information from its environment, including visitors to the space, creating “self” and “nonself” categories and classifying each input as “self” or “nonself”. 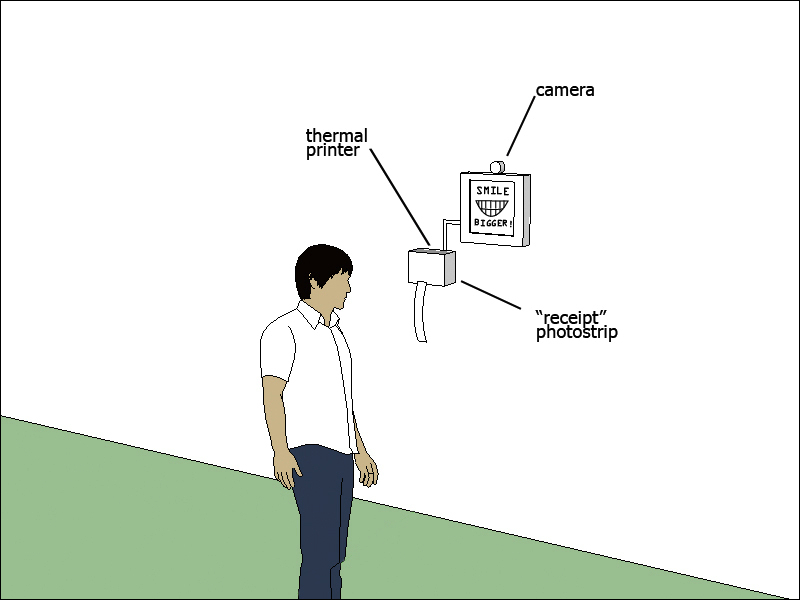 Elements that are “self” would be illuminated with a continuous light projection. o Black Box: Decision of whether the input is self or non-self. Can the blackbox decide for itself what will be one and the other? I am inspired by biology, and find that the underlying principles are fundamental to our understanding of our selves and the universe. I’m particulary interested in topics like self-organization, consciousness and agency, and how these can be found at multiple levels in Life. Here the idea is simple. As one walks by the installation, his or her face gets imprinted in the screen in a two-dimensional representation: a circle of some color and some size. The learning happens before the installation is shown and it consists of learning two functions: one from the face image to a color, another from the face image to the size of the circle. The functions are learned from (face, color, size) triples made arbitrarily by the artist based on any features of the faces (e.g. facial expression/emotions, eye colors, hair styles, perceived personality, etc). In the end, during inference, the input data is the camera images captured of the audience and the output is the image with colored dots floating around. While trying to come up with ideas I realized I still don’t quite understand what machine learning is, so I focused on the idea of having an input and an output. My idea is also probably not really feasible as is, but I think maybe if it was changed around enough it could be done. Anyway, the viewer walks into a room surrounded by water behind walls of glass. Kind of like a fish tank except without fish or plants. As the viewer enters, droplets of water fall from a hole in the ceiling and land on some kind of waterfall contraption. I’m imagining something like a marble drop where the water slowly drips to the ground. Eventually the water would fall on the floor and disappear down a drain. The amount of water falling would be measured by the number of breaths the viewer takes (possibly the longer the breath the more water falling?). And if there are more people in the room, more water droplets would fall. I really don’t know if this is possible, but I liked the idea. Please click the image for larger version. The idea is that we all love(d) the “choose your own adventure stories.” This brings the idea another step forward. Suppose there is a bank of phrases, perhaps user generated over time, that can be drawn from. Then, at the appropriate time, the user will pose (perhaps with some given props for some direction) and get his/her picture taken (in an automated fashion). The ML aspect would be an image recognition step to guess at what action the person is performing. Then, it would cross reference this with the bank of phrases and insert a new sentence/idea into the story. At the end, it would produce a print out of this user generated adventure. Matt’s Assignment 1 – Art Everywhere! My installation, based around the idea that children (and adults) would love to draw and paint wherever they please, is a room in which the floor and walls are touch-sensitive electronic canvases (the black boxes of the installation) that let the people inside of the room do exactly that. Whenever someone or something touches the floor or a wall, a paint-like mark will be output by the surface in response to the touch input and let the people in the room feel as if they are actually painting. 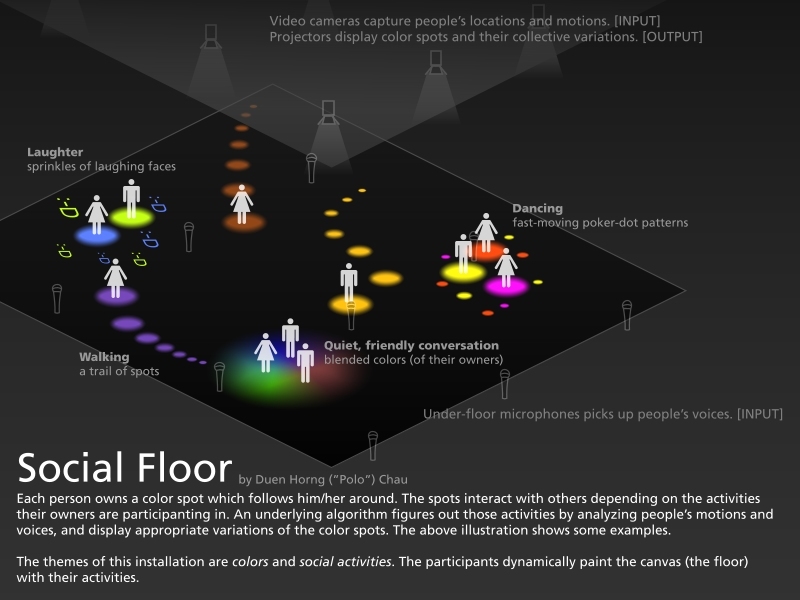 In the four corners of the room are cyan, magenta, yellow, and black areas that people can step in or touch to change the color with which they leave their marks. The CMYK marks can be blended together with older marks to create any color that the people in the room wish to make. Each time a new color is chosen, all new “paint” marks are made in that color. This will encourage children to collaborate with each other and parents to collaborate with their children to “paint” something together. When the children and/or parents leave the room, they will have the option of either printing out or e-mailing themselves their creations so they can have a souvenir and a memory of a good time that they shared together.